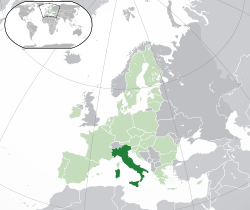 Italy (it, lij, nap, pms & scn: Italia, eml: Itâglia, fur: Italie, lmo & sc: Itàlia, roa-tara: Itaglie, vec: Itałia), ni chalo icho chili kwa Europe. Pali anthu pafupifupi 60 507 590 m'dzikoli (2017). This page was last edited on 29 January 2018, at 15:50.